Also known as the Produce Market, this one-story brick building in the agricultural hub of Lake City was built in 1936 as a project of the Public Works Administration. Lake City once produced more strawberries than any other place in South Carolina, and though the Pee Dee region is well-known for its tobacco farms, Lake City grew a variety of cash crops that made the town economically formidable. When this warehouse was built, it was the site of the largest green bean auction in the world. 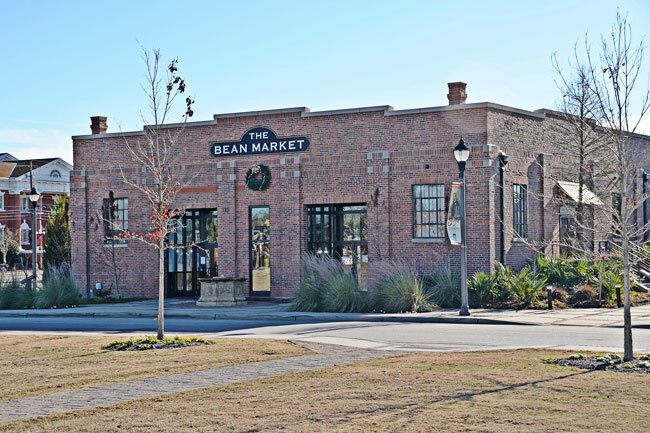 The market for green beans declined following World War II, and the building was then used for various municipal purposes, such as the Health Department and the Lake City Civil Defense. The city restored the 10,000 square-foot building in 2002, and today the former warehouse is a community center and event site. The Lake City Downtown Historic District is a collection of sixty-two commercial buildings, forty-four of which are contributing to the character of the district, which illustrate the commercial development of the town between roughly 1910 and 1930. The district’s buildings reflect the one- and two-part commercial blocks found in towns throughout the nation, and represent stylistic influences ranging from the late Victorian period examples displaying elaborate brick corbeled cornices and pediments to the more simplified and stripped down Depression-era examples with typical low relief detailing and vertical piers. Corner stores and banks featuring either a Classical or Renaissance Revival style and the brick depot and surrounding brick warehouses help anchor the district along both the town’s Main Street and its broad intersecting railroad corridor. Lake City once had the most diversified agricultural market in both North and South Carolina, marketing such produce as strawberries, snap peas, cucumbers, squash, limas and other assorted vegetables. From its season opening the last of April through the end of July, the city’s agricultural market sold assorted produce. From August 1st until late autumn, the area operated as the state’s second largest tobacco market. As a result of the growth of agriculture in the area in the early twentieth century, the downtown area businessmen began replacing older frame buildings with new brick structures. The success of local cash crops gave a more expendable income to the average farmer in Lake City and was extremely instrumental in changing the face of the downtown area.